This large pale gold-tone vinyl clutch is by Christian Dior Parfums. The base of the flap closure has a shiny gold-tone panel of 3 squares high and 30 squares long on a metallic thread background. It has a golden-honey vinyl lining. There is a one-snap closure under the flap. The right inner side has several pinholes - probably from a tag. A South American model got it as a gift for Christmas from her boyfriend who filled it with perfumes and candy and a diamond watch. 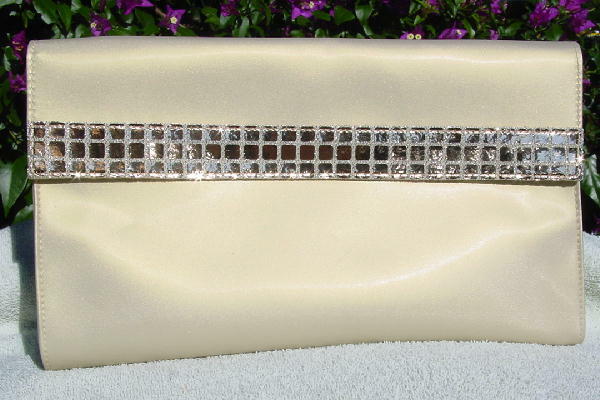 She used it several times as an evening purse in South Beach and New York.